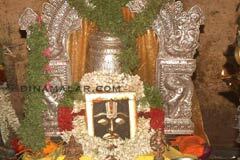 Brahmmotsavam in Masi (February-March), Ramanuja Jayanthi, Vaikunda Ekadasi, Navarathri are the festivals grandly celebrated in the temple. The idol is differently sculpted in a square stone. Lord Venugopala graces with consorts Rukmini and Sathyabama along with Nammalwar, Sri Ramanujar, Manavalamamunigal, all Vaishnavite Acharyas. 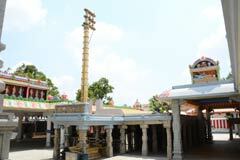 There are also shrines for Santhanakrishna, Paravasudeva and Nagar. The idols of Venugopala, Rama and Gopikas are very beautiful. Sri Aranganathaswami Temple, Karamadai- 641 104, Coimbatore. +91- 4254 - 272 318, 273 018. People pray for prosperity and wealth. They perform Milk Abishek to Lord and also donate cows to the temple. The Lord is in the womb chamber (Garpagriha) on a square seat. 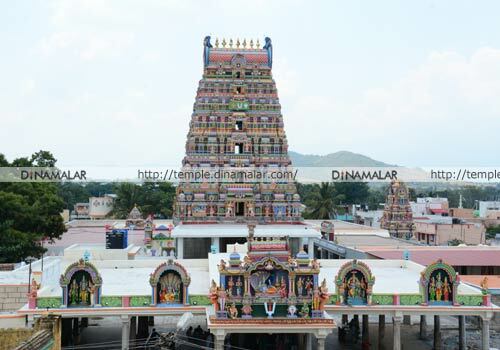 During his journey to Tirunarayanapuram in Karnataka, Sri Ramanuja traveled through this place. 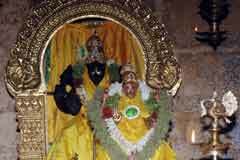 In Tirupathi, Lord Venkatachalapathi is on the hills while the Mother is in the foot of hill. In Karamadai, the Lord is in the floor place while the mother has her shrine above Him. The scar is visible on the Lord’s body. 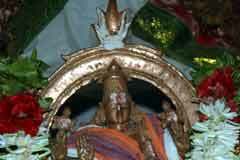 Mother Ranganayaki is on a hill nearby praised by the devotees as Betathamman. During the Brahmmotsavam in the month of Masi (February-March), on the 5th day, the priests goes to the hill, personifies the Mother in the Water Pot (Kumbam or Kalasam) bring it to the Lord’s shrine, and his bow and perform pujas. Next morning the wedding festival is celebrated. In later days, a shrine was built for Mother Ranganayaki. 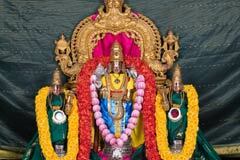 Blessing of Ramabana: Generally, the procession deity is near the presiding deity. During the festivals, He goes in procession and returns back. Here, the procession deity is in front of the sanctum sanctorum. The presiding deity being small in size, he could not be directly worshipped by the devotees if the procession deity is also placed near him due to His being big in size and would hide the presiding deity. While blessing the devotees, in Vishnu temples Sadari (having the feet of the Lord) is placed on the head of the devotee. 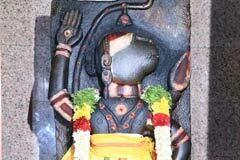 In this temple, instead of Sadari, Ramabana is placed on the heads of devotees. It is believed that the Ramabana has in itself, the discus (Chakrayudha) and Adisesha his snake bed. Sadari blessing is offered in the procession deity shrine. Puja is performed to the Ramabana once in a year. Kavala Seva: The Lord appears on His Radha on the Maha Star day during the Brammotsava festival. The devotees in their excitement use to greet one another saying “Govinda is coming, Ranga is coming” and offer Prasads made of fruit, sugar and honey to celebrate the festival. 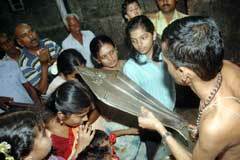 They also celebrate Thanneer Sevai, washing the feet of the Lord with Water, (Thanneer-Water) and also hold torches. The tradition follows from the days when the Lord was under the earth. Paalaabishekam – bathing the Lord with Milk is performed on each New Moon day. 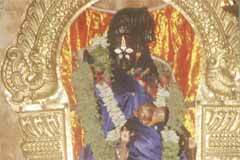 Anjaneya is on the left facing the Lord. The idol is differently sculpted in a square stone. Lord Venugopala graces with consorts Rukmini and Sathyabama along with Nammalwar, Sri Ramanujar, Manavalamamunigal, all Vaishnavite Acharyas. 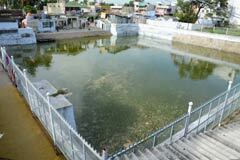 There are also shrines for Santhanakrishna, Paravasudeva and Nagar. The idols of Venugopala, Rama and Gopikas are very beautiful. The place was then dense with Karai trees. A shepherd grazing his cows was watching a cow that never gave milk to him and found that it was pouring its milk in a bush there. When he dug the place, blood came out. He informed the people. A voice from the sky told them that the Lord was there. The temple was built then here. Karamadai is 30 km from Coimbatore on the Mettupalayam road. The temple is very near the bus stand. Hotel A P: +91-422-230 1773 – 5 lines.